We set up the post apocalyptic shanty town of Standard Falls as shown above. 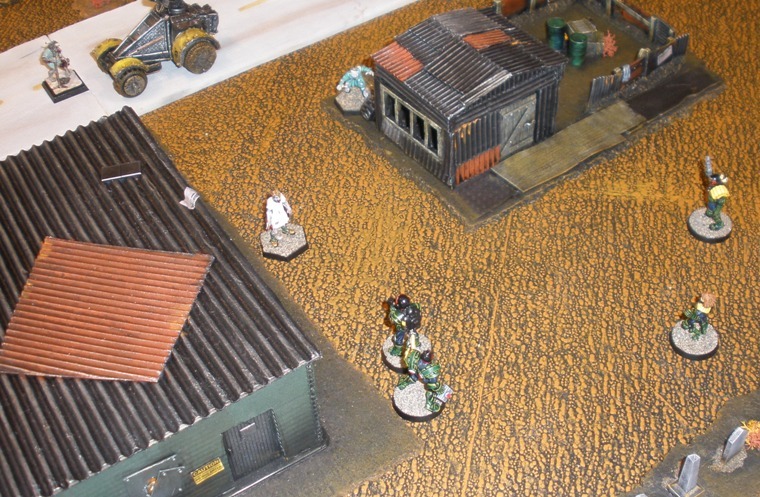 This was the first game to use most of the scenery shown, as I put the majority of it together earlier this year. I got a kick out of simply setting it up to be honest. Standard Falls isnt finished just yet (more stuff in the pipeline) but it is satisfying to have got it even this far. A lot of factions were added in the most recent JDMG update. 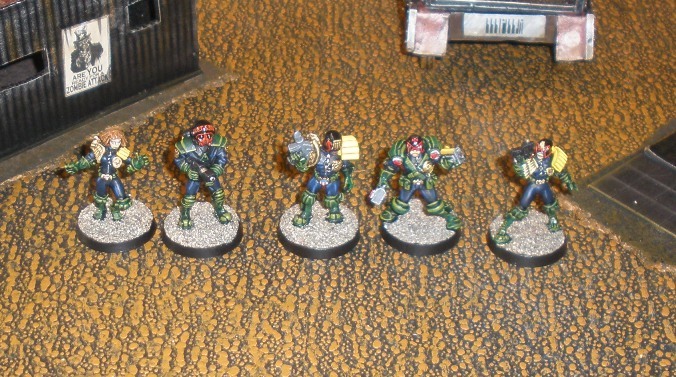 I have suitable minatures to field many of them, but as I have most recently been working on Mega City One Judges, I wanted to use some of them again (above). I was sorely tempted to use a zombie or robot force, but the Judges won out in the end. As there were three players we decided to keep things simple and go for a game with two sides, rather than three. Both MT and PB wanted to play using zombie forces so they each chose a force using half the points of the Judge force. Above is PBs force of sickos led by Patient Zero (the Zombie Master) plus his henchman the horribly mutated Hoo Hoo and five former humans. MTs force of rather gorier cadavers was led by the kinematically redundant, cybernetic demonoid, Adam. MT had sunk a chunk of his points into Adams formidable psychic arsenal. The scenario was set to be the assassination of the opponents leader(s). Street Judge Giant was the most senior on the Department side. In turn the judges had to apprehend or failing that execute both Patient Zero and Adam. 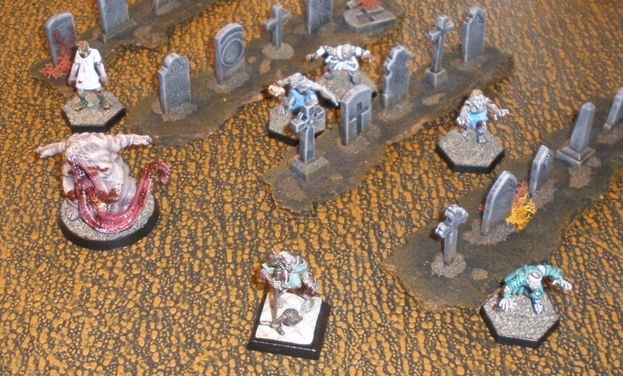 The Judge force proceeded Northward while each undead force attempted to flank them. Which is kind of tough seeing that as yet, the only zombies sighted in Judge Dredds world have been the traditional slow variety. 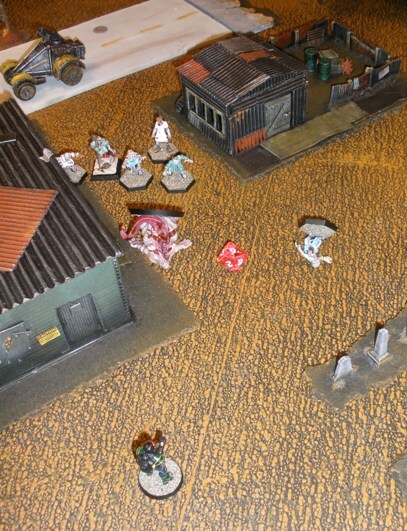 Patient Zero psychically impels his rotten rogues down the abandoned street. Riot Judge Barrabus has dealt with the walking dead before (or at least has seen a lot of old Horror tri-vids) and knows that standard projectiles have reduced effect on the living impaired. Riot Foam on the other hand is just as effective on the dead as on the living. 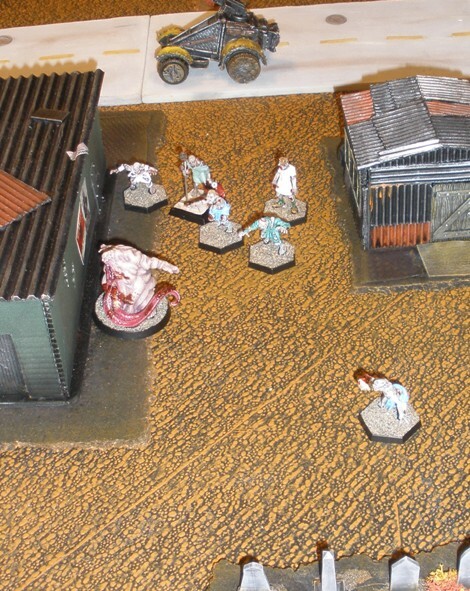 With a jet from from his foam gun Barrabus locks Hoo Hoo and one of the zombies in place, still gnashing their teeth but completely incapacitated. Patient Zero starts to get nervous. 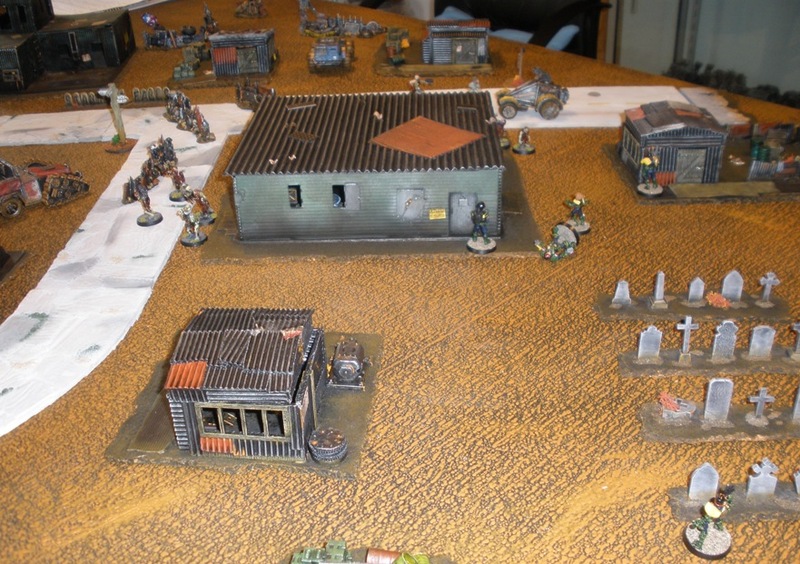 The Judge force proceeds with the refused flank (not that difficult against shuffling undead) and concentrates the attack on Patient Zeros forces. Spotting the danger Adam begins the slow redeployment of his force. After another devastating display of Justice Department riot foam drill, Barrabus tops the zombies forces “Most Wanted” list. Anticipating this, Med Judge Trapper moves close enough to administer stimm packs when Barrabus is dropped by a psychic assault. 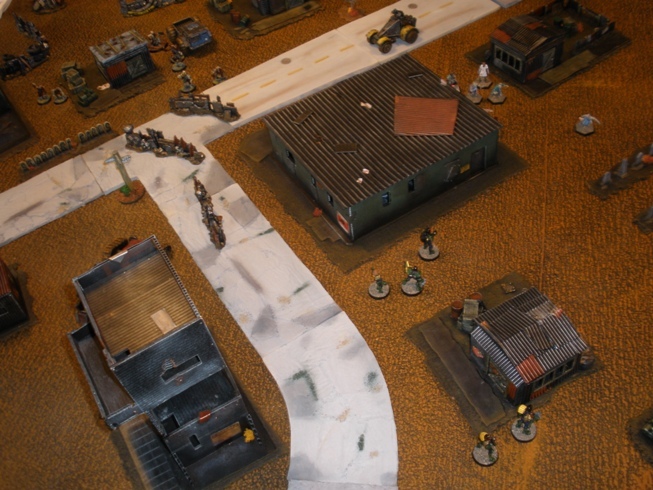 Giant and Geller provide Hi-Ex covering fire. 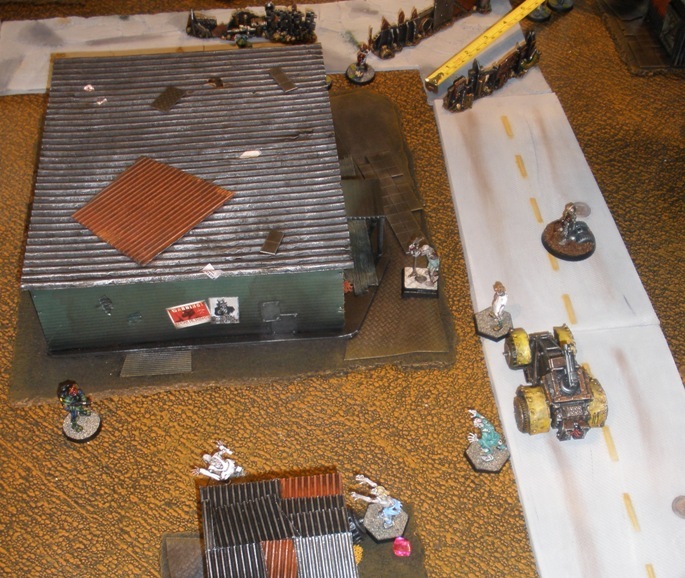 Barrabus backs around the corner to regain his breath while Trappers selfless heroism is rewarded with a psychic blast that causes his brains to run out of his nose. Giant remains close enough to tempt the zombie masters into stalling their retreat. The view from the Southern edge. Note the Rookie (bottom right) who has been helping to hold Adams forces in indecision on the West side of the large building. With the sort of efficiency that one would expect from a totalitarian police state, the zombie rising of 2143 is crushed in its early stages. Not a particularly tactical game, but I enjoyed it. I did get to thoroughly lambaste two gaming buddies simultaneously with my newly painted miniatures over my newly built and painted terrain though, so that helped. What was interesting was that some of the rules that were used had been modified since our previous JDMG session, in part due to feedback that we supplied on the Mongose forum. Power to the people indeed. Dredd would crush that sort of feedback under his reinforced heel. JDMG is proving to be one of my favourite miniature gaming systems yet. I am not sure exactly what it is about the system that I like (although I have a number of theories that I wont blather on about here) but the whole seems to be greater than the sum of its parts. Its pretty “clean” as systems go too, which is important. And of course the fact that a system that is working as well as this for our group is officially based in the Judge Dredd licence is completely fantastic as far as I am concerned. 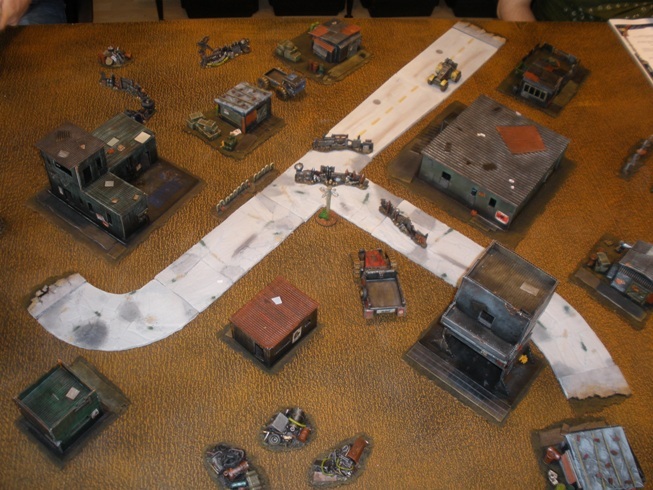 We also played a game of In the Emperors Name on the same terrain following this game. I will report on that soon. 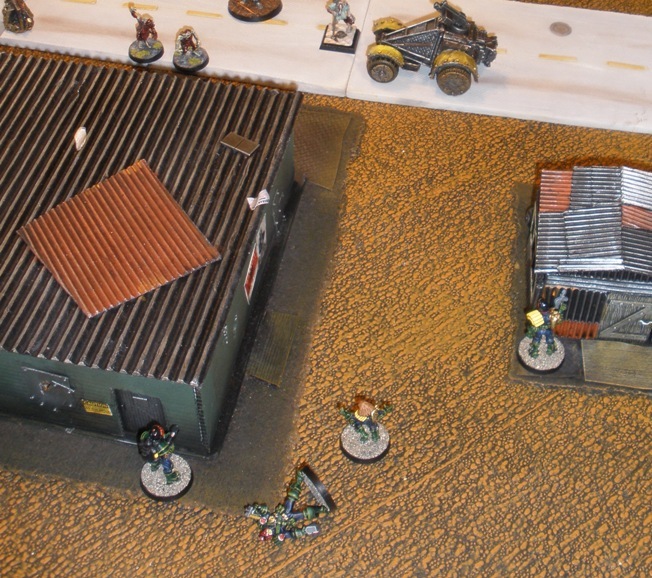 Seems you all had a good game, and with nicely painted miniatures it just makes the experience THAT much better. I have a few more interesting terrain pieces lined up, a windmill, a water tower, that sort of thing. They will hopefully make the town just a little more authentic. I also got a Zuzzy mat in the post last week, which will hopefully make the whole thing gel that much better. I hope to get working on the mat and the other terrain soon, but I have to renovate the Man Cave first, so it will likely be Xmas or 2012 before they get done. That’s a good looking table you’ve got there! Looking forward to seeing the rest of the terrain. Did you get the Zuzzy mat from overseas or did you find a European reseller? The terrain is “getting there”. I am pleased with my progress so far but have a few more buildings to do. I also want to add some little touches to bring it a little more to life. To my knowledge Zuzzy dont have a European stockist. I ordered direct from their site. The seem to be snowed under with orders on a permanent basis and as a result state that they have a six week turnaround time on their site. Apparently they dont respond to email very reliably either. These factors have made a few vocal internet folks irritated with Zuzzys service, which is understandable. I went in knowing these factors and got my two 6×4′ mats within two months without any hassle. The mats were worth the wait. They really are quality. I cant wait to get gaming on them. I’ve been eye-balling Zuzzy’s Broken Blacktop mat now, and it looks really cool. I’ve read a few reviews and saw some movies on Youtube, and I must say that I’m impressed! What mats did you buy? Will you paint them up and/or make a review? I had been lusting after the Zuzzy stuff for a while, but the price looked prohibitive. With exchange rates the way that they are currently and a couple of other factors coming into play I bought two 6×4′ mats. 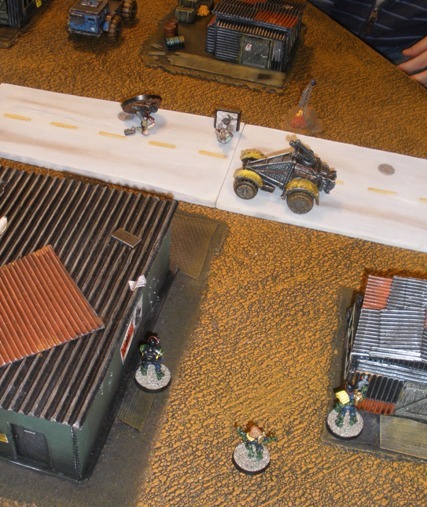 I bought a Broken Blacktop for modern urban zombie games and Dredd and the like. I wanted a suitable mat for post apocalyptic or alien desert games. Many have bought the Sulfur Fields mat for that purpose, but I am not to keen on that one. It looks a little like animal hide or leather in the photos and that wasnt what I wanted. 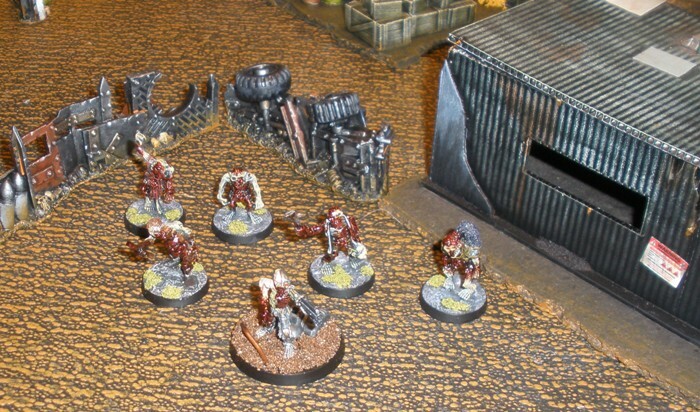 I bought the Scourged Forest mat for my post apoc duties as it looked to have a nice amount of detail without being to cluttered. It is lovely to look at right now, even unpainted. I plan to document my painting of the mats for putting up here, but it will be after Xmas before I get to them I suspect. The man cave is in disarray while I put up shelves and reorganise the whole thing. It will take me a few weeks before I can do anything hobby related in there.